Beef quarter pounders with seasoning. At Birds Eye, we have carefully sourced the finest cuts of beef from a select group of trusted UK & Irish farms. We are confident that we bring nothing but the best quality burgers to your dinner. 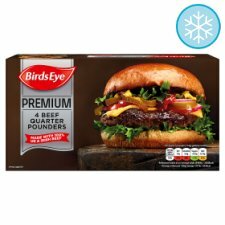 Our Premium Beef Quarter Pounders are perfect to satisfy those bigger appetites, but also tantalise the taste buds. Passion, care and attention has gone into our recipe, so we can proudly say we are a cut above the rest. It simply is all about the burger. Turn over regularly. Cook until no pink meat remains. Please ensure your quarter pounders are cooked until piping hot and cooked throughout, without any pink meat remaining. Cook in middle of oven, on a baking tray with upturned edges.